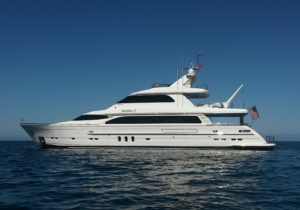 “Maximus II” is a true wide-body tri-deck motoryacht with 3 staterooms for owner and guests plus 2 staterooms aft for crew/guests if desired, enclosed sky lounge with day head as well as an open flying bridge. The 23.5 foot beam together with the 106 foot length creates terrific volume, normally only seen in much larger yachts. There is a spacious swim platform which doubles as a fishing cockpit and also a safe water level access for boarding and water sports. “Maximus II” has enjoyed impeccable maintenance since new and has been enjoyed on both east and west coasts USA, Mexico, and in the Pacific Northwest, ready for her next adventure. See in the San Diego Boat Show June 7-10 on Harbor Island!